PenDelfin borchure with PenDelfin rabbit Sunny on the front. The PenDelfin rabbit Sunny was designed by Doreen Noel Roberts and introduced into the PenDelfin family in c1992. 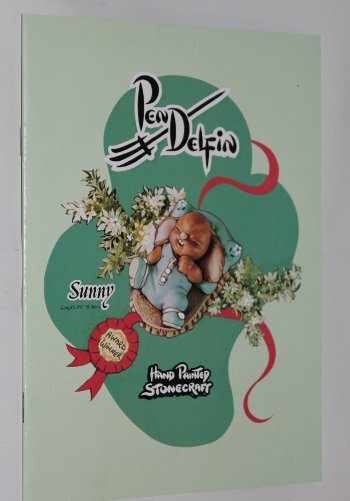 This PenDelfin brochure opens like a book and contains 14 pages of different PenDelfin rabbits and stands that were available to PenDelfin collectors when the brochure was issued. Inside this PenDelfin brochure it pictures among many pieces the PenDelfin Rabbit Band featuring Thumper and his Piano, Solo, Rocky, Rosa, Rolly, Casanova & the Bandstand. Whilst later on in the brochure it displays the PenDelfin collector's china plates, The Old Schoolhouse, Gingerbread Day and Caravan. Condition: Excellent overall condition. A very lovely PenDelfin brochure.